Bangladeshi People can check their result through Online, Mobile SMs and Android App. 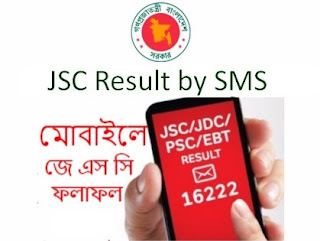 In this post, You will get concept about the JSC Result 2018 by SMS. SMS System is the best alternative process to check Result. In Bangladesh, Most of the people is now out of Internet Service. Some of them don't have the Android Device or Smartphone to check Result from Online. So, Mobile SMS System will work better to for the JSC Result. Let's follow our guide and check JSC Result 2018 from Mobile SMS. most of us don't know the procedure of Mobile SMS System for JSC Exam Result 2018. Teletalk Bangladesh Limited has added this system. Any operator number will support to send the message. So, you can check your JSC Result 2018 from your own Mobile Phone. Standard SMS Charge will applicable for each Message send to 16222 for your result. First, follow the below Mobile SMS System. Open your Mobile Message Option and type the below Message. After typing, send the message to 16222 from your own Mobile Number. While sending the message correctly after publishing Result, you will receive a return Message with your Result. Some people send message before publishing the Result. If you send your Result Request before publishing Result officially, you won't receive your Result. Instantly, you will receive a return Message Like: JSC Result isn't publish yet. It will publish after 01:30 PM. If you need any help or can't check JSC Result 2018 by SMS, just inform us now. We will reply you back shortly. Thank you for being with us.